Known for its skill in machining titanium and other hard metals, Chicopee Manufacturing is an industry leader. Based in Kitchener, Ontario, just outside of Toronto, the company produces components for the world’s biggest aerospace players. The company needed to expand its expertise in producing parts with these advanced materials, and it wanted to make its high-mix, low-volume part production processes more efficient. It also needed to prepare its operation for long-term production contracts for structural frame components found in military and commercial aircraft. The MAS-A5, which coordinates operation of the cell, was an attractive feature that led to Chicopee choosing this system. 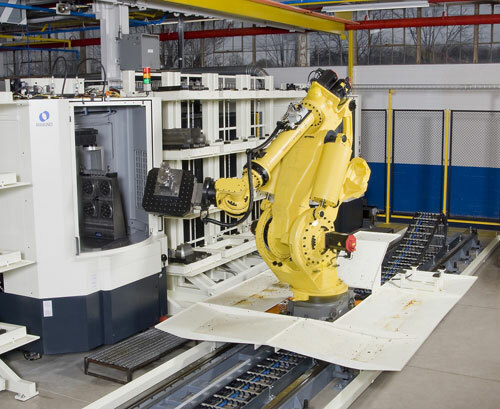 The flexible manufacturing system brings accuracy to the entire operation. Chicopee has replaced machine pallets with smaller fixture plates that are center-mounted for full tool access. These fixture plates help reduce fixture costs. Parts move through the cell efficiently, in keeping with the just-in-time production that is employed to account for the high cost of raw materials. The flexible manufacturing system produces parts 24/7. The 8,000-rpm spindle on the a81M provides the power and precision needed to cut titanium, and the company plans to add three more a81 machines to its operation as orders for production aircraft get under way.